The rush that comes with owning exclusive stuff can be extraordinary -- imagine how empowering it must be for the Duke of Sutherland to say "I'm the world's sole owner of Raphael's Bridgewater Madonna", or for Britney Spears to say "I'm the world's sole owner of Federline's Playing With Fire". 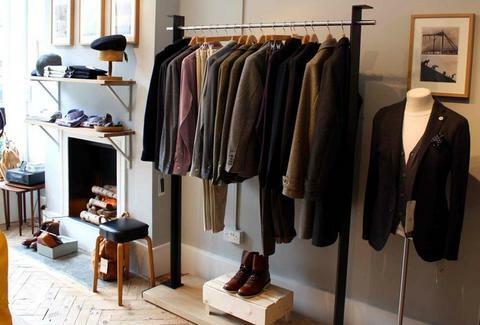 Boasting a peerless menswear collection, Trunk Clothiers. A two-story, wood-floored style redoubt opened in Marylebone by an expat Swede, Trunk deals in understated international duds mostly impossible to find elsewhere -- in fact, they estimate that they're the exclusive UK stockist of 90% of the goods lining their walls, and left in the dressing room by guys who couldn't lie their way into those 34s. Big brand merch sees cotton workshirts from US giant J.Crew, jeans from Japanese powerhouse Beams+, and jackets from Italian stalwart Boglioli that lean towards the casual, like a light grey unstructured number cut from soft, woolen "jersey material", so you know wearing it won't be very taxing. Smaller-name exclusivity includes hats from old-school Swedish label Wigens, fine-weave fitted shirts by Italian micro-brand MCR, and previously only-in-Kyoto jackets from cutting-edge casualists Stealth Wealth, like a memory-fabric'd dark blue reversible blazer -- though if their wealth comes from the Stealth, shouldn't they be making bombers? Meanwhile, a strong homegrown showing sees brogue-style boots from Lodger, Sunspel tees and boxers, and woven soft-leather belts by east London's Ki:ts, pronounced "Keats" -- a reminder that perhaps Britney should be frozen in our minds back in a time when she was still as unravished as Madonna. No, the other Madonna.